Gold stars aren’t just for elementary school. 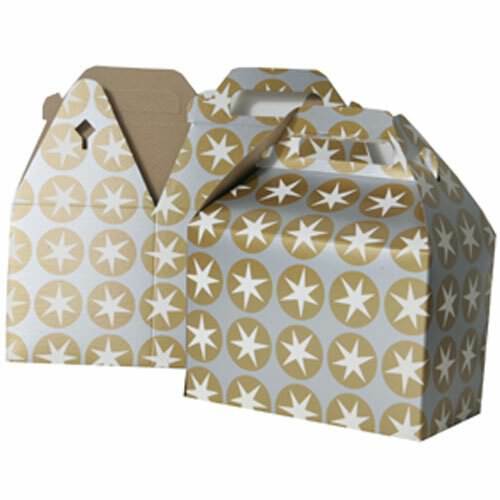 Show everyone your A+ baking skills with our Silver & Gold with White Stars Gable Box with Handles. Perfect for packaging sweets and small gifts, these boxes make great party favors and promotional gift boxes. Your guests will love the original donut box design, and you’ll love how easy they are to fold together and set up. And when you’re not throwing parties, use them as cute lunch boxes for you and your family. With a sturdy paperboard construction and locking tuck flap handles, you can be certain that all your goodies and gifts will stay safe and secure. And since these ship and store flat, you can keep a bunch in a closet or cupboard for all your future party planning and lunch making. There will be no demerits handed out if you choose this gable box! And who wants a demerit? Silver & Gold with Stars Gable Box is available in 3 7/8 x 7 15/16 x 5 1/4.